The Outlander’s seven-seat option starts a spec level up from the front-drive entry-level ES, in the all-wheel-drive LS. The $36,490 mid-range variant also brings a larger 2.4-litre petrol four-cylinder rather than the base model’s 2.0-litre. You get an extra 14kW and 30Nm through a standard continuously variable transmission, and fuel consumption remains respectable, at 7.5L/100km. Comfort and refinement levels can’t match the best in the class, while the handling is merely okay. But the Outlander isn’t big or unwieldy and offers plenty of room for big families for relatively few bucks. Against the Gold Star Cars criteria, it holds its value well and is relatively inexpensive to insure comprehensively. The 12-month service interval is welcome, while the Japanese brand’s five-year warranty is generous. Never mind that the warranty runs to 130,000km, rather than being unlimited. On average, we Aussies only do 14,000km each year – warranty years are therefore far more important than kays. The Outlander’s a winner, and by a decent margin from its nearest rival. 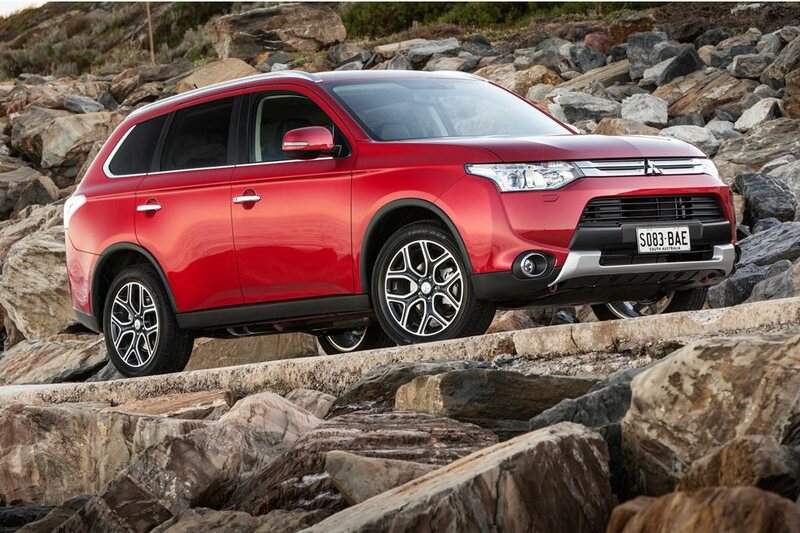 * The original Gold Star Cars feature, published in the Wheels November 2014, named the Outlander ES as the winner of the Medium SUV seven-seater category. Except that, erm … the ES is a five-seater. However, the Outlander’s cash-saving strengths are inherent to the model, rather than one particular spec level, and aside from a higher purchase price and a small fuel use penalty, the LS is just as easy on the wallet as the ES, but with that crucial extra row of seats. That makes the seven-seat Outlander LS AWD the winner of the category. NISSAN’S new-gen mid-size SUV remains a buyer’s (not driver’s) car, with a third-row option for the first time. A 70 percent three-year resale is stellar, but a six-month service interval takes the shine off. SOLID rather than standout performance earned Captiva the bronze. Its 9.1L/100km economy and 60 percent three-year resale are fair; it’s cheap to insure at $968, but the nine-month service interval is oddball.